Opa! A Greek diet is often considered a healthy diet, and with a combination of fresh vegetables, yogurts and meats, it only makes sense to be eating it during the week. Greek food is also part of the Mediterranean diet, which just happens to be one of the healthiest overall diets out there, helping to cut heart attack and stroke risks, as well as aid with weight loss. But there's another benefit to making your own Greek food at home. Greek restaurants tend to use a lot of butter and saturated fats in their dishes, according to 3FatChicks.com, so if you are planning to eat Greek at a restaurant, stick to the seafood or souvlaki dishes. And in case you missed it, last week we packed veggie recipes. Here's what you need to buy this week, while the other necessary ingredients (like pepper, salt and oils) are likely already in your kitchen. In our new weekly feature Pack It, we offer readers five tasty, healthy and inexpensive snacks for the office, your commute or just those days when you feel like trying something new. Each week on Friday, we'll provide you with a shopping list, along with five recipes you can prep on the weekend, and take along from Monday to Friday. On Monday (hopefully with leftovers from a Greek salad you made on the weekend), try this salad bite recipe, combing delicious feta cheese and sour cream on a chopped cucumber slice. Get the recipe here. Tzatziki can be healthy (and nutritious) if you make it at home. This recipe includes low-fat Greek yogurt and diced cucumbers and onions. For work, bring some whole wheat pita chips or bread for dipping purposes. Get the recipe here. This one may be a little messy, but it is the perfect snack to make at home. The combination of Kalamata olives and tomatoes makes the perfect Greek-style bruschetta. Get the recipe here. Hummus is traditionally a Middle Eastern dip but it is quite popular in some Greek recipes. This recipe can be made with Greek yogurt as well — how healthy! Get the recipe here. 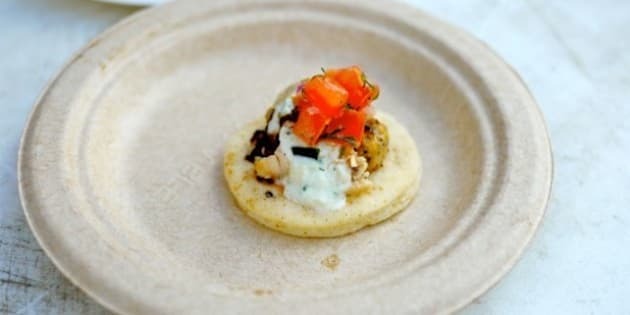 Keeping with our trend of bite-sized options, we also have this Greek souvlaki bite recipe made with fresh oregano and chicken breast. Get the recipe here.